Replacement cartridges for the Aquasana 2-Stage Under Counter Drinking Water Filters (AQ-5200.55 and AQ-5200.56). Long-lasting filter cartridges only need to be replaced every 500 gal. or 6 months to keep your Aquasana 2-Stage Under Counter Filter performing at its best. It has 90 days warranty. Specifications and Dimensions- Capacity: 100 Gal. per day 50/60 PSI and 770F - Feed water pressure: 40 - 100 PSI - Feed water Temperature: 400F - 1000F - Max. Total Dissolved Solids (TDS): 2000 ppm - Max. Hardness: 10 gpg - Max. Iron 0.2ppm - pH limits: 4 - 10 - Length: 10 inch, O.D. = 1.8 inch - 1/4 inch Fitting - Weight: 0.8 lbs. The key component of a COMMERCIAL Reverse Osmosis water purification system, usually used in the 4th stage. It have very tiny holes, which allow only water and a few gases to pass through under certain pressure thus produce virtually pure water. The technology has been used in spaceships to recycle water for astronauts. It is effective in reducing hardness, heavy metals, toxins, free chlorine, bad taste, odor THM, Organics, hazardouschemicals, and pesticides. Depending on inlet water quality or flow rate, it needs to be replaced every 24 months or 48,000 Gal.s of water. 2-Stage Drinking Water Filter Replacement Replacement cartridges for the Aquasana 2-Stage Under Counter Drinking Water Filters (AQ-5200.55 and AQ-5200.56). Long-lasting filter cartridges only need to be replaced every 500 gal. or 6 months to keep your Aquasana 2-Stage Under Counter Filter performing at its best. It has 90 days warranty. 2-Stage Drinking Water Filter Replacement is rated 4.7 out of 5 by 1065. Rated 5 out of 5 by Tina from Unit beeps when time to change the filters. Easy to... Unit beeps when time to change the filters. Easy to replace. Rated 2 out of 5 by Trub from TOO EXPENSIVE - replacement filters cost as much as the whole unit. TOO EXPENSIVE - replacement filters cost as much as the whole unit. Rated 5 out of 5 by Jo from We recently moved to the area and our city water... We recently moved to the area and our city water had a really bad taste. The previous owner had a Aquasana unit already installed but it needed new filters. We purchased these and YES I can drink the water from the tap again! Thank you for making such a great product! Rated 5 out of 5 by Angeline from These are replacement filters for the under sink system I purchased - the system provides good ta... 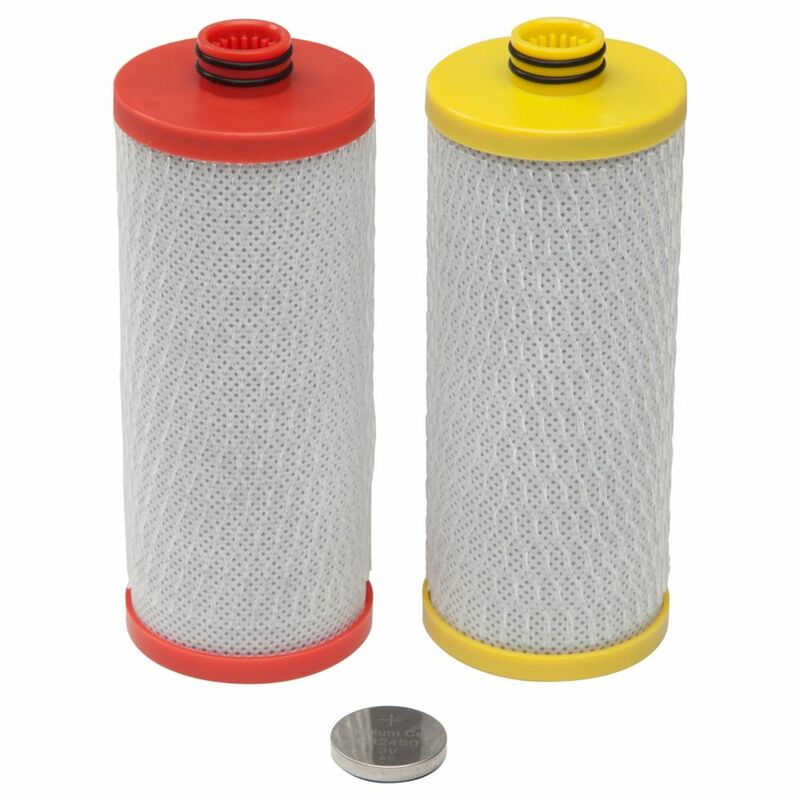 These are replacement filters for the under sink system I purchased - the system provides good tasting water and the filters are easy to change. I've had the system for about 18 months and change the filters about every six months. Rated 5 out of 5 by HomeDepotCustomer from The product performs as it should; the online ordering process... The product performs as it should; the online ordering process is very easy to use. Rated 4 out of 5 by TN Stud from Simple Installation I replaced a similar 2 filter system with the Aquasana 2 stage system because the other system developed a leak. Installation was simple because I could use most of the old plumbing. Water tastes about the same as the other system. Flow rate appears to be a little lower. But it doesn't bother me.